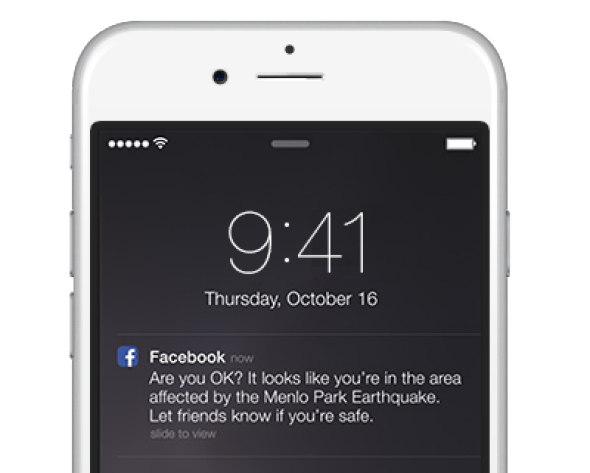 Facebook Safety Check helps you find friends in a disaster. Facebook could be surprisingly helpful in a disaster. We’ve known for a long time that Facebook is no longer cool. In a recent survey of teenagers, fewer than half said they use Facebook. So far that loss of cachet hasn’t seemed to affect the company’s overall growth. As I’ve argued many times over the years, Facebook’s long-term success doesn’t hinge on its trendiness among teens. It hinges on whether the social network can graduate from a procrastination tool to a utility. What can a post-cool Facebook do to make itself indispensible, besides serving as a more colorful, 21st-century version of the White Pages? A new feature called Safety Check is a promising sign that it’s working to figure that out. When a major disaster hits, like an earthquake or a flood, Facebook’s Safety Check feature will push a notification to the smartphones of users in the affected area. It will prompt them to click a button that says either “I’m safe” or “I’m not in the area.” That update will go on their Facebook news feeds, and will also be collected in a database that their friends and family can search in order to check on them. Facebook says the idea grew out of a “disaster message board” project started by its engineers in Japan after the 2011 earthquake and tsunami. Whenever such disasters happen, the company said in a press release, “we see people, relief organizations, and first responders turn to Facebook in the aftermath” to find out who’s affected and who’s OK. This is a very smart way to capitalize on what may be Facebook’s greatest asset: the sheer size of its user base. Facebook’s near-ubiquity among Internet users in many regions of the world puts it in a unique position to compile a comprehensive database of status updates. It may not cover absolutely everyone, but it would make a great first stop for anyone hoping to confirm at a glance that their loved ones are alive and well. Safety Check might irk Facebook holdouts and others who dislike feeling pressured to log into the social network in order to allay their friends’ worries. For what it’s worth, though, I can’t imagine it will be so widely used that your loved ones will panic if they don’t see your name on there in the event of a disaster. Rather, the people who find it convenient will use it, and those who don’t will find other ways to let people know they’re not dead. A bigger potential hitch is that major disasters often knock out Internet and cell service. Still, it helps that Facebook’s Safety Check lets people mark their friends as safe. In the wake of Hurricane Sandy, I and many others were worried about one friend who we knew was living in a building that had been flooded. We assumed she was all right, but no one could confirm it because we couldn’t reach her. My wife and I ended up making a two-hour trek through the flood zone to track her down in person. Fortunately, she was fine, and we quickly put the word out on Facebook that she was in good health and spirits. Those who saw the update were grateful and relieved, but concerned queries continued to trickle in. Safety Check would have made it much easier to put all of her friends and family at ease. Believe it or not, Facebook is also working on an answer to the Internet-connectivity problem. It’s one of several companies, along with Google (see video below), that are developing drones and other flying objects that can beam down Wi-Fi from overhead.